WASHINGTON — As it awaits congressional action on its 2011 budget, NASA is proceeding with plans to award roughly $200 million to companies developing technologies in support of the agency’s commercial space transportation goals. NASA contacted eight companies in February, inviting Alliant Techsystems (ATK), Blue Origin, Boeing, Excalibur Almaz, Orbital Sciences Corp., Sierra Nevada Corp., Space Exploration Technologies (SpaceX) and United Launch Alliance (ULA) to Johnson Space Center in Houston to discuss their proposals for a second round of awards under the agency’s Commercial Crew Development (CCDev) program, according to industry sources. NASA hopes to make the awards in March. NASA spokesman Michael Braukus said in a Feb. 22 e-mail that procurement regulations prevent NASA from commenting on questions about CCDev. Multiple industry sources had said NASA contacted six companies in writing the week of Feb. 14, inviting them to discuss their bids in Houston and laying out the strengths and weaknesses of specific proposals. ATK spokesman George Torres told Space News Feb. 22 that NASA has invited ATK to discuss its Liberty rocket proposal with CCDev officials the week of March 7. Excalibur Almaz Inc., Houston-based firm developing a crewed system incorporating flown Soviet-era space hardware designs, also has received a writtent invitation to meet with NASA officials to discuss its CCDev proposal, according to the company's president, former astronaut Leroy Chiao. "We are honored to have this opportunity," Chiao told Space News Feb. 24. Traditionally, a callback is no guarantee of an award. NASA also can issue an award without calling a company to come in to discuss their proposal. NASA started the CCDev program in 2009 with $50 million in economic stimulus funds. The agency awarded the first round of contracts last February to a mix of five new and established aerospace firms, including Blue Origin, Boeing, Sierra Nevada and ULA. The companies used the money to refine technologies in support of U.S. President Barack Obama’s plan to nurture a private market for transporting astronauts to low Earth orbit. NASA officials have said the value of the second round of CCDev contracts, known as CCDev 2, will depend on funds appropriated this year. The NASA Authorization Act of 2010 recommended Congress appropriate $312 million for NASA’s commercial crew initiatives this year. However, the U.S. House of Representatives approved a continuing resolution Feb. 19 that would slash funding for NASA in the remaining seven months of this fiscal year by about $600 million below the $18.7 billion appropriated for the agency in 2010. Under the first round of CCDev awards, Kent, Wash.-based Blue Origin — bankrolled by Amazon.com founder Jeff Bezos — proposed advancing technologies in support of the New Shepard vehicle it is designing to take off and land vertically and carry three-person crews to suborbital heights. Blue Origin spokeswoman Gwen Griffin declined to comment on the status of the company’s CCDev 2 proposal. Chicago-based Boeing announced in December it was seeking CCDev 2 money to accelerate development of a crew capsule able to launch atop various rockets. 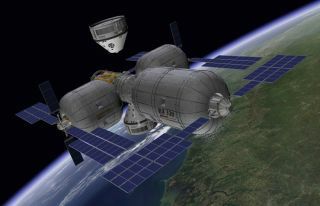 The proposed project, which includes a teaming arrangement with North Las Vegas-based Bigelow Aerospace, would build on work performed under the first CCDev round that defined Boeing’s CST-100 space capsule design. Dulles, Va.-based Orbital Sciences is proposing to develop a lifting-body spacecraft capable of carrying at least four passengers to orbit by 2015. Orbital officials believe the spacecraft, designed to launch atop a ULA-built Atlas 5 rocket and dock with the international space station, could be ready for test flights as early as 2014. Sierra Nevada’s plan also involves a runway-landing, lifting-body vehicle called Dream Chaser that the company has been working on for several years. The Sparks, Nev.-based company garnered the largest first-round CCDev award with $20 million to build and test a vehicle structure and propulsion system. Both Orbital and Sierra Nevada are teaming with Virgin Galactic of New Mexico to market commercial rides on their respective spacecraft and conduct drop tests of their lifting-body space vehicles using Virgin’s WhiteKnightTwo carrier aircraft, the companies announced in December. SpaceX’s proposal would begin work on a launch-abort system that would enable the Hawthorne, Calif.-based company’s Dragon space capsule to carry astronauts. ULA, the Denver-based Boeing-Lockheed Martin joint venture that builds and operates the Atlas 5 and Delta rocket families, supported multiple first-round CCDev projects and also won its own award to develop emergency-detection system technologies needed before astronauts can launch atop its rockets. The company’s CCDev 2 proposal expands on work completed under its first-round contract. ATK announced Feb. 8 that it is partnering with Les Mureaux, France-based Astrium Space Transportation to build a crew launch vehicle, dubbed Liberty, that would combine an Ares 1-derived solid-rocket first stage with an upper stage derived from the Ariane 5 rocket's cyrogenic main stage. ATK and Astrium said they could field a vehicle quickly enough for a 2013 inaugural flight, with a second flight in 2014 followed by operational capability in 2015.